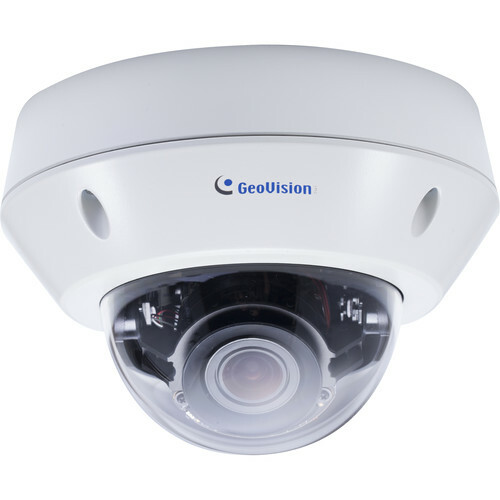 The GV-VD2712 2MP Outdoor Network Dome Camera from GEOVISION is an outdoor camera equipped with an IR cut filter and IR LEDs for day and night surveillance. It is adjustable along three axes and supports H.265, H.264, and MJPEG video compression to maintain video quality while using reduced network bandwidth. With its CMOS image sensor, the camera can provide a color view in near darkness, down to 0.005 lux. The GV-VD2712 uses WDR Pro to process scenes with contrasting light intensities and produce clear images in challenging environments.